The FPGEE is based on a nationally uniform content blueprint. The blueprint provides important information about the topics covered on the examination and the knowledge you are expected to demonstrate while taking the FPGEE. Prepare with our FPGEE Study Guide and Practice Questions. Print or eBook. Guaranteed to raise your score. Get started today! The FPGEE is uniformly developed, administered, and scored under policies and procedures developed by NABP’s Advisory Committee on Examinations and approved by NABP’s Executive Committee. The content of the FPGEE is approved by practitioners and educators from around the country through their service as Examination Review Committee members and item writers. All candidates are tested on their mastery as outlined in the FPGEE Blueprint. FPGEE Flashcards. 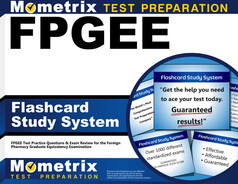 Proven FPGEE test flashcards raise your score on the FPGEE test. Guaranteed. 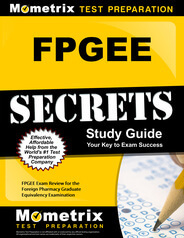 The FPGEE Blueprint provides an outline of the topics covered on the examination. It offers important information about the knowledge, judgment, and skills you are expected to demonstrate. A strong understanding of the Blueprint will aid in your preparation to take the examination.